White truffles, that intoxicating delicacy that hits menus every fall, are apparently more expensive this year than last. The musky, earthy, buttery fungus is already one of the rarest and most extravagant ingredients, mostly because the little nuggets can’t be domesticated; they have to be foraged alongside the help of trained pigs or dogs under roots and trees in the Alba region of northern Italy. But while the quality is stellar this year, the quantity and the truffles themselves are small, so prices are higher. That is definitely reflected on menus around town, but it’s not deterring chefs from using them, or, as it seems, people from eating them. 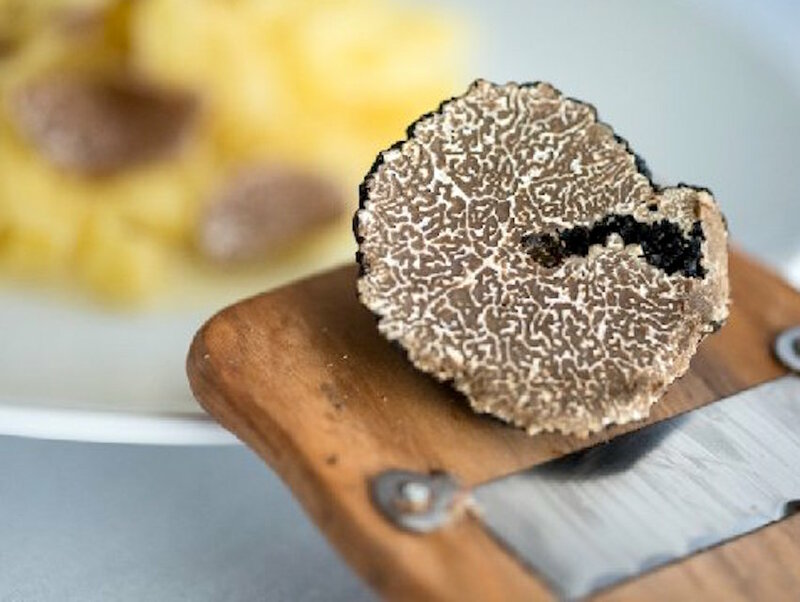 “We are not the most expensive in town, but I am confident that we have some of the best truffles in the city,” says Providence chef and owner Michael Cimarusti. “And we serve a generous portion.” He believes a lot of restaurants use white truffles as an opportunity to gouge guests, but he simply wants people to have the opportunity to try one of the most coveted foods in the world. “We could charge more, but we don’t.” He is currently serving a few truffle-centric dishes at the Hollywood restaurant, and will continue while supplies last. Due to this year’s prices, Piero Selvaggio, who was the first restaurateur to serve truffles at Valentino more than 40 years ago (he’s also credited for first bringing them to the West Coast), has initiated a BYOT (Bring Your Own Truffle) policy at the longstanding Santa Monica restaurant. Bring a nugget for the table, and the servers will shave as much as you want on any dish for a $30 supplemental fee. Of course, there’s also the annual truffle tasting menu that’s available till the end of the year. For the real truffle ballers itching to spend to impress, here are the most extravagant (and extravagantly priced) truffle dishes around town right now. Money Dish: Scrambled egg with black-pepper phyllo. This is the probably the most truffle-heavy dish on Curtis Stone’s November all-white truffle menu, a little cup filled with perfectly scrambled eggs, a good inch of truffle shavings, and a wispy little cracker on top. Price: $375 per person for nine courses. Money Dish: The uovo al tartufo, or the classic egg yolk-filled ravioli finished with butter cream and truffles. It’s part of the restaurant’s annual white truffle tasting menu. Price: $295 per person for six courses. Money Dish: The cheese pizza with truffles. It’s exactly what it sounds like, only 1,000 times better than any cheese pizza you’ll ever eat. You can also get some truffles shaved on agnolotti or tagilatelle pasta. Money Dish: Why have three eggs, sausage and pancakes for breakfast when you can have three eggs, sausage and pancakes showered in white truffles? Puck’s hidden restaurant at the tony hotel has the special daily. The pancakes also come with white truffle syrup and truffle butter, fwiw. Money Dish: The truffle egg, a mainstay on the menu made even better with some white truffles shaved on it. It’s hard to resist the risotto, tagliatelle or agnolotti with truffles, too. Money Dish: The truffle omelette. Cimarusti stores farm-fresh eggs in the same container as the truffles so they’re already permeated with the perfume. Then he takes a classic omelette, foldes slices of Rodolphe Le Munier’s Camembert inside, and tops it with more truffles. Money Dish: The Brentwood Italian spot features a few dishes with truffles this year, but the Wagyu beef tenderloin with baked eggplant mousse and white truffle is a standout.